Nothing brightens a room like fresh cut flowers. The fresh fragrance and splash of color enlivens any room lucky enough to be graced with their presence. Unless you reside in a tropical climate or have a greenhouse, chances are fresh cut flowers will not be something you are blessed with everyday. Although the luscious scent of fresh flowers cannot be replicated, it is possible to capture their beauty. The artist of our current exhibit, Paint & Palette, has stunningly captured some exquisite flowers in her picturesque floral paintings. 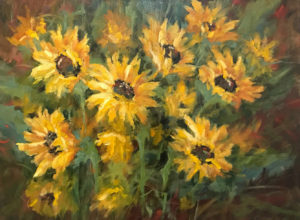 Kansas Sunflowers a 16-inch by 20-inch oil painting is a striking rendition of a bunch of bright and luminous sunflowers. Charming petals depicted in a wondrous array of yellows created with thinner yet fully loaded brushstrokes display full blossoms that are at once slightly abstract yet completely definable. The radiant blossoms surround a distinct disk center created with choppy narrow strokes filled with light and dark hues. Watery green stalks thrust these purposeful posies to the viewer as if offering them their very own ray of sunshine. These dazzling sunflowers would brighten any room in any season. The Hansen Museum’s Continuing Education Program has many learning opportunities in June. Joy of Painting classes are scheduled for June 10th and 11th. These classes are an excellent opportunity to try your hand at painting. All necessary supplies are provided and step-by-step demonstrations guide the student from start to finish. On the 16th and 17th of June, we are delighted to have the Albin Watercolor Painting Workshop. Instructor Laurie Albin has been painting with watercolors for 42 years. During this 2-day workshop, students will learn watercolor techniques and how to employ these new skills with hands on methodology. If either of these fun opportunities sounds enticing to you, please call the Museum at 785-689-4846. Blaine White of Downs, Kansas is June’s Artist of the Month. Blaine’s art is a form of wood inlaying called intarsia. Barns, hummingbirds, cowboys, animals, and other items are the subjects of Blaine’s elaborate woodworking masterpieces. Blaine’s items will be available for purchase during the month of June.